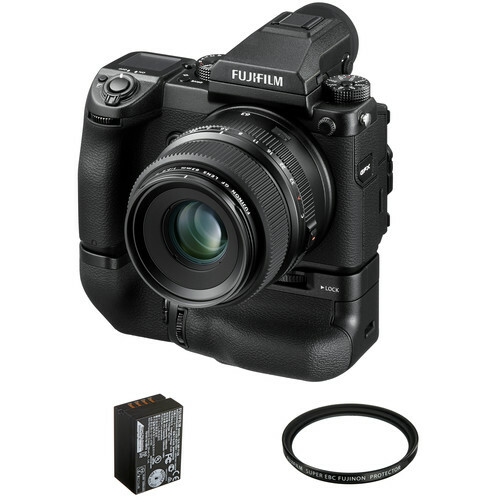 Bundling everything you need to begin working with the high-resolution medium format system, the FUJIFILM GFX 50S Medium Format Mirrorless Camera with 63mm Lens and Battery Grip Kit from B&H includes the camera body, the GF 63mm f/2.8 R WR lens, and the VG-GFX1 Vertical Battery Grip. Standard-length prime lens offers a 50mm equivalent focal length to realize a normal field of view for working with a variety of subjects. The optical design incorporates one extra-low dispersion element to reduce chromatic aberrations and color fringing throughout the aperture and focusing ranges for notable clarity and color fidelity. The front optical group is used for focusing to Minimize aberrations and distortions throughout the focusing range. Dedicated to the FUJIFILM GFX 50S medium format mirrorless camera, the VG-GFX1 Vertical Battery Grip benefits shooting in the vertical orientation and can also be used to effectively double your battery life. The grip accepts one additional NP-T125 rechargeable lithium-ion battery for extended shooting times, and it is compatible with the optional AC-15V AC Adapter for charging the battery within the grip. In terms of its physical design, the extended shape incorporates a secondary shutter release button as well as additional function buttons and control dials to mimic the camera's own layout for intuitive handling. Dedicated to the FUJIFILM GFX 50S medium format mirrorless camera, the NP-T125 Rechargeable Lithium-Ion Battery is a spare or replacement item for the one originally included with the camera. The 62mm Protector Filter from FUJIFILM is a simple, clear filter with a 1x filter factor and is designed to provide general protection for those lenses as well as any other lens with a 62mm front filter thread. This optically clear filter does not affect the overall image quality while helping reduce dust, scratches, moisture, and other elements from damaging your lens. This filter is multi-coated and features Super Electron Beam Coatings to help reduce flare and improve light transmission. Box Dimensions (LxWxH) 9.3 x 8.8 x 7.5"
Box Dimensions (LxWxH) 8.5 x 6.5 x 5.7"
Box Dimensions (LxWxH) 7.8 x 4.9 x 4.1"
Box Dimensions (LxWxH) 3.9 x 2.2 x 1.6"
Box Dimensions (LxWxH) 3.2 x 3.0 x 0.8"
GFX 50S Medium Format Mirrorless Camera (Body Only) is rated 4.4 out of 5 by 21. Rated 5 out of 5 by John Daniel S. from Landscape and Astro perfect for me The details I can pull out the sensor is amazing. Coming from Nikon FF the raw edit is incredible. Amazing camera for my landscape and nightscape purposes. But for wedding and events using this as backup camera it is good nothing great, D750 beats it in low light shooting. The EVF on this is terrible at night and lag makes this camera not suitable for events in low light. Attached is the milky way stack I shot using GF110mm lens. This lens and GF45mm are my go to lenses for panorama along with GF23 I'm good for now. Rated 1 out of 5 by JeanYoshii from Excelent camera, but... The problem I had was related to the EVF. It came defective, not working since day 1. Come on. A c?mera that costs this much should not come with such problem. And worst than that, after contacted the Fujifilm support in Brazil (i’m From Brazil), they told me that I have to send the camera and the EVF to the service center and the estimated time to fix it is about 120 days!!! I have 40 weddings a year and can not afford to work with only 1 camera for 120 days. So I am stuck with a broken EVF using only the LCD display because I can’t even buy an EFV. There isn’t for sale. Rated 5 out of 5 by Hugh from Brings back the old times. I used a Mamiya RZ67 for more than twenty years to do forensic photography; crime scenes, car crashes, evidence of other types. After film almost disappeared and I retired, I sold the Mamiya equipment, and eventually decided that I wanted to continue with medium format plus Mirrorless for scenery, animals & etc. When I found the Mamiya GFX 50S, I almost instantly decided that, This is It. I have not been disappointed. I especially like the tethered shooting capability and the ability to download the photographs to my laptop as they are shot. The Film Simulation Mode promises additional capabilities. The RZ67 was a great camera in its day; the GFX 50S appears to be even better! Rated 5 out of 5 by Joseph from Well-suited for the subjects I enjoy shooting I've had the camera and a GF 32-64mm f/4 lens in my possession for several weeks now, and have plenty of good and not much bad to say about shooting with the GFX. I came to Fuji from Canon full-frame, adjusting to the GFX's ergonomics was not immediate - but, for the most part, I find the Fuji's ergonomics and controls to be quite good. Particularly once you've taken the time to assign custom functions to the various buttons to suit your preferences (decoupling AF-on from the shutter button and reassigning it to the rear command dial press being one of my recommendations). If I had to complain, getting your bearings after turning on the camera requires you to take a moment to assess what settings you had in place the last time you used it - and switching to your intended settings may require adjusting multiple dials. I miss having a single top dial that allows for fast and simple switching between aperture/shutter priority, manual, and custom shooting modes (which is something my Canon bodies offered). With the GFX, I primarily find myself shooting in full manual and use the front/rear command dials to adjust shutter speed/aperture/ISO. I don't find the ISO/shutter speed controls on the top plate to be particularly useful, as adjusting them would require taking my eye away from the viewfinder or my hand away from the shutter button - thankfully those controls (along with the aperture rings on the native GF mount lenses) can be locked and assigned to the front/rear command dials. Autofocus - I hardly spend any time with the continuous/servo AF mode enabled, I found that mode to be borderline unusable during my hands-on time with a body using the v1.00 firmware (it was constantly hunting), and I haven't bothered trying it again using the current v1.11 firmware (which is supposedly an improvement). I'm fine with that - I didn't move from DSLR's to medium format for things like continuous AF performance or burst rate - and the AF mode I care about, single shot AF, is more than sufficient, and has proven to be very accurate and reasonably speedy in most lighting conditions. AF points cover nearly the entire frame, can be changed quickly with the joystick or touchscreen, and punching in to check focus is immediate once activated. Overall, the camera feels very responsive, and I have yet to experience any bugs on the v1.11 firmware. The viewfinder is huge, bright, sharp, shimmers a bit when autofocus is engaged and shows moire when focused on fine detail/complex patterns (this moire also appears when using the rear screen in live-view mode). Refresh rate is 60fps in good light and lag is minimal, but the refresh rate does slow down in low-light and/or as you lengthen shutter speeds (the resulting increase in exposure is helpful when using manual focus on a tripod in low light). Some things I love about this camera - the robust build and extensive sealing, dual UHS-II SD slots, the articulating LCD, exposure lengths of up to 60 minutes possible directly in camera, the focus distance and DoF scale shown in the viewfinder/rear display when shooting with native GF lenses (extremely convenient for any tripod work - manually focused nightscapes, landscapes or architecture with ND filters), the built-in dual axis electronic level, the extremely flexible files (dynamic range and detail are both highly impressive), the baked-in film simulation profiles are convenient to have as a base to start editing raws from (I'm partial to Provia and Arcos). Battery life - pretty decent, I've been getting around 400 images per battery, which includes long exposures and plenty of camera on time between exposures. I've had hands-on time with all of the currently available native GF mount lenses, and expect to add the 23mm f/4 and 110mm f/2 to my kit eventually. The 32-64mm f/4 is a great starting point, however, and I'd pick it over the 63mm f/2.8 - other than the somewhat restrictive minimum focus distance, the zoom is easy to recommend, autofocus is speedy and internal (an improvement over the 63mm f/2.8), wide open it's sharp across the frame, has good contrast, bokeh and rendering are almost prime-like, stopped down you get attractive sunstars, flare is handled well and has a pleasing aesthetic. Rated 5 out of 5 by gökhan from Beast I am a fashion photographer and all i can say is this camera is a beast. Great colours like a film camera. Tilt shift Evf is amazing. Evf is very big and clear. Battery life is nice for me. Front curtain shutter is so silent and helps you to shoot about 1/60 seconds. Lenses are sharp and made very well. Beautiful medium format camera to buy! Rated 5 out of 5 by James from Mind-bending image quality with some operational quirks What I liked about the GFX: The images this camera generates are simply unbelievable. The high-ISO capabilities and shadow recovery are superb. This has been the first digital camera I've ever used that produced images that reminded me of film - nearly wet/liquid, as if you were looking at a medium format film transparancy on a light table (only with much more depth in the shadows). The Fujifilm GF lenses for this camera are razor sharp edge-to-edge, wide open to stopped down. Jaw-dropping. The size of the body is really nice and small. It's smaller than my Canon full-frame bodies, and I could actually fit it along with two extra lenses in a small MindShift backpack designed for a full-frame mirrorless system. The quirks with this camera: A laggy EVF. This makes a huge difference when trying to get the perfect expression or even just getting the model's eyes open in the shot because what you're shooting isn't exactly the same moment as what you're viewing in the EVF. I had to train myself to keep both eyes open and use my right eye for framing and my left eye to actually watch the scene for the moment or moments to click the shutter. Having used the Leica Q, I was disappointed in the GFX's EVF refresh rate and quality. The default setup for it has bad flicker (seriously Fujifilm?). I found online that I could turn off film-look simulation in the EVF and set the colors to be more neutral and finally I had a usable EVF. The good news is the EVF is removable, meaning if Fuji updates it for the next model, it's likely they will be interchangeable. Maybe Fujifilm will be able to address some of the EVF quirks in a firmware update soon. It is a serious oversight on Fujifilm's part to not include a physical exposure compensation wheel on top. I would give up the unnecessary LCD display on top to get one. Hopefully they will rectify this in the next version. I was happy, though, to find I could set the back wheel to be dedicated to exposure compensation (make sure and update the firmware to the latest version for this to work properly). Battery life is epic. Kudos to Fujifilm for not being shy about putting a car-sized battery in there! My biggest gripe about the GFX system is the longest telephoto coming sounds like it will be 200mm or shorter, which is not near as long as I had hoped for. Hopefully one day they will release something in the 300-400mm range. There are landscape shots I simply cannot get without one. Rated 5 out of 5 by Douglas from Exactly what I wanted Tired of waiting on D850 backorder slips I decided to chuck all of my Nikon digital kit and make a move. I hate a lot of post-processing so Sony was out. Hasselblad was also examined but the limited lenses and enormous expense per lens was a deal killer (I did try out both brands). My goal was to find the absolute best image quality for urban photography, cityscapes and landscapes (I use M43 for other types of photography). Short review - very happy to say goodbye to Nikon after 37 years. Longer review. Positives - Phenomenal, jaw dropping, eye popping image quality. Mission accomplished. - Focus is very good. Not what I expected based on what I saw in online reviews. Even at night it works great. Firmware update? - Sensor can shoot multiformat in camera (6x7, 6x9, 6x24, 1x1, 6x4.5...err... 4x3) and still provide high res images in all formats. - Even the kit zoom is very sharp. Also have the 110 which is the sharpest lens I have ever used. Even against my old Zeiss and Nikon lenses. Kudos to Fujifilm. - What can be recovered in shadows without introducing noise has to be seen to be believed. Negatives - Image stabilization is limited to some lenses (none of which I have bought) which means my tripod is always with me. Since I also shoot Panasonic this is probably more bothersome than it would be for most. - Ergonomics stink. I have to take my eyes off of the viewfinder to find the right dials at time (not everything can be controlled with the wheels). Again - coming from the best ergonomics in the industry with Panasonic probably makes this tougher. Still - Fuji - it is not 1995 any longer. You are free to make your cameras user friendly. I can live with the negatives - especially the ergonomics. Amazing what we can get used to. Images make up for all shortcomings in my book. This camera is really overpriced for most people. Be sure it is a match for the types of photography you do. But if that includes landscapes, cityscapes, urban photography and portraiture you will not find a better tool anywhere. Rated 5 out of 5 by Edgars from Thats what I was looking for years... I sold my canon 5DSr and lenses I used before for landscape photography and bought GFX and 23mm lens. It's a beast. I love those raw files how they turn out now. Menu buttons are much easier to use compare to Canon. Was easy to set up. In one word I love it! Can you use with Fuji X lens? I agree with the others: It May be possible to find an adapter that would allow you to physically mount X lenses on the GFX bodies, but those lenses are not designed to project an image across the entire, larger sensor. The more common situis to go the other way by putting legacy medium format lenses on the GFX cameras via adapters. The GFX 50S appears to have a proprietary connector snap to attach the camera strap. Will Fuji offer a standard pin post that will work with the vast majority of after market straps? this is the same strap system that hasselblad uses. Do we have Video recording specs? Video details are yet to be released. When we know, this product listing on our website will be updated. Bit depth is 14 bit and 14 stops of dynamic range. Which LCD protector will fit the GFX 50s? Will the Giottos one for the Canon 1DX that is 3.2 diagonal work? Expert Shield makes one now. Are the lenses distortion free? It all depends on the specific lens, but no lenses will be perfect. Wider-angle lenses may tend to have more distortion, in-general, than telephoto lenses. Which produces more vibration - leaf or focal plane shutter? A focal plane shutter will produce more vibration. 50 megapixels but only 1080/30fps video? That doesn't seem right to me considering the competitions video capabilities. Is that correct? That is correct, this camera will be able to record only up to 1080p at 30fps.